In its most extensive statement yet, the New York Times is refuting Donald Trump's claims against veteran investigative reporter Serge Kovaleski by saying "the facts speak for themselves." Trump says the Times should apologize to him, but an apology is not in the cards. "We continue to find this behavior outrageous," a Times spokesperson said Sunday in response to questions from CNNMoney. Trump has been tangling with Kovaleski for the better part of a week. It all started when Trump made comments about watching "thousands" of people in New Jersey "cheering" the collapse of the World Trade Centers on 9/11. Numerous fact-checkers said his comments were untrue, so Trump seized on a story co-written by Kovaleski, then with the Washington Post, seven days after the attacks. Kovaleski's story said authorities had detained "a number of people" in Jersey City who had allegedly been seen at celebrations. But the allegations were never found to be true, and in any event the story didn't prove that Trump watched anyone cheering. When asked about the controversy, Kovaleski said in a statement, "I certainly do not remember anyone saying that thousands or even hundreds of people were celebrating." He was implicitly discrediting Trump, and the GOP candidate was incensed by it. "You oughta see this guy -- 'uh, I don't know what I said, uh, I don't remember,'" Trump said at a rally on Tuesday, while flailing his arms. 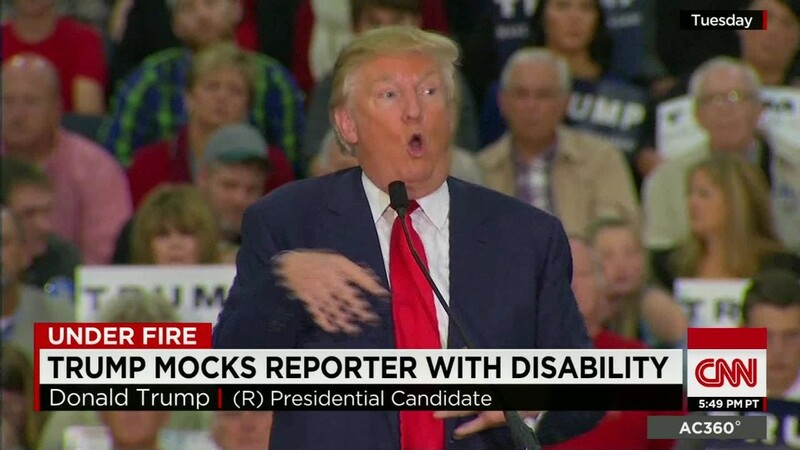 Many of Kovaleski's colleagues came away thinking that Trump was purposefully lampooning the reporter's disability. Kovaleski has a chronic condition called arthrogryposis, which limits the movement of his arms. Trump then denied knowing about Kovaleski's condition and suggested he might not have ever met the reporter. In the new statement on Sunday, the Times said, "While Mr. Trump says he does not remember Mr. Kovaleski and does not know he had a disability that restricts control over his hands, the two spent time together in the 1980s and 1990s when Mr. Kovaleski worked for the Daily News." The statement added, "It's worth noting that in his initial comments last week, Mr. Trump referred to Mr. Kovaleski as 'a nice reporter' and said 'now, you have to see this guy' before moving his hands in a jerking fashion that mocked Mr. Kovaleski's disability." Katrina Pierson, a spokeswoman for the Trump campaign, said on Sunday's "Reliable Sources" that Trump "would never" knowingly mock a person's disability. "He has so much respect and care and compassion," she said. "So, why would he do that intentionally?" At a rally on Saturday, Trump repeatedly called the Times "failing." Asked whether Trump will keep up his criticisms of the paper, Pierson said if it "continues to attack him and write negative articles that are false about him, he'll continue to respond in kind." "If they don't apologize, that's on them," Pierson added. "They're the ones that had the reporter back-track his own story." Trump similarly said on Saturday that Kovaleski back-tracked: "He took back a statement that he wrote 14 years ago." But Kovaleski did not retract anything he wrote. The Times said Sunday that the original story "did not support Donald Trump's claim that thousands of Muslims were celebrating in New Jersey after the 9/11 attacks. When Mr. Trump referenced the story recently, Mr. Kovaleski did not back away from his story, but merely said his reporting did not support Mr. Trump's claim that thousands were celebrating."